When my sister moved to Atlanta for graduate school, I was happy for her. The separation was sad, but she was making a success of her life, and it wasn’t forever. I understood. But when my parents decided to join her down south in Atlanta, well…..
that was just a bit too much. I felt slightly.. abandoned. Hey I know I’m way out of diapers, but I STILL WANT MY MOMMY. Atlanta is far. Far enough to make a one-day drive with 2 kids nearly intolerable, and other than freshman year of college I’d never lived more than an hour away from my folks my whole life. So when they made the move – to ATLANTA of all places, I was more than peeved. I was hurt. And angry. And not a little bit PISSED OFF, especially AT ATLANTA. What was so freaking great about Atlanta? Man, I really hated that town. They did it right, burning it down like that. What did Atlanta think it was, luring my family away from me? SCREW COKE WORLD, I thought. At least here we have drinking water and can flush our toilets. I am NEVER going to set foot in effing Atlanta. NEVER! But like sands through the hour glass….after a few months of not seeing my parents, and speaking to them less and less frequently, I caved like a sinkhole. Time apart from my loved ones had made me think differently. If Atlanta had taken them, I would just have to see why. And so, this summer, we visited twice. And Hey Mikey! I liked it. Sure it wasn’t dirty dangerous Philly, but it had appeal. It wasn’t interesting in that old historic way, but it was BLING!BLING! like a newly-minted penny. My parents have a gorgeous home. They are happy there, except for missing us. So.. it’s different than we’re used to, but things down there are nice. AND CLEAN. And the People are pleasant. They let you in in traffic. They don’t try to run you over when you’re crossing the street. You can walk the hell out in front of their cars in a parking lot, and they STOP AND SMILE and wave you on. WOW. I DO still hate the fact that you have to drive absolutely everywhere in Atlanta, and it is hot as b*lls in the summer, but summers here in Philly are humid and disgusting too. And my parents have central air and A POOL. So, yes, I have officially come around. And being the way I am, when I “come around” I REALLY come around. The place I once hated, now I can’t wait to visit again. And not just for my family. But for the STUFF. Atlanta has stuff we don’t have here. STUFF THAT I LIKE. On our visit during the holidays, I came to appreciate even more the charm of the place – or maybe just the charm of the shopping. It’s everywhere. Miles and miles of stores. Sure, they’re mostly the same stores we have here, but they’re like our stores on STEROIDS. The brand new Target here is like their SUPER TARGET’S shrimpy homely cousin. Their Trader Joe’s is awesome and it SELLS WINE AND BEER!!! No wonder people there are so nice. CAN YOU IMAGINE THAT SORT OF CHEAP CONVENIENCE?! I must have gone to the Super Target by my parents house 3 times in 4 days. I just never wanted to leave. I wanted to LIVE THERE. And I am not joking. I felt like some poor deprived third-worlder having stumbled upon paradise. AND I AM NOT THAT INTO SHOPPING, PEOPLE! It’s just THAT GOOD. During one of the Target shopping trips, I came upon something which stopped me in my tracks. You know how great Target is? How every single thing they make is just so irresistably cute/cool/hip and unbelievably inexpensive, that you think surely this corporation has sold its soul to the devil? Well, you will then understand what I have to say. You see, I like wine. I love wine. If I didn’t have kids, I would probably be a full-fledged wino. Well. ATLANTA TARGETS SELL THEIR OWN BRAND OF BOX WINE – but they are CUTE!! AND COLORFUL!! AND FILLED WITH WINE!! AND WHY AM I STILL LIVING HERE IN PHILLY???!! I don’t even like box wine, but now I do because it’s like everything else at Target. IRRESISTIBLE. I bought the above box of Riesling as a souvenir to bring home, and I don’t even like Riesling. Not even a little. But I thought I WILL LIKE TARGET BRAND BOX RIESLING, I just know it! So we stuck it in the fridge when we got home, and didn’t open it all last week b/c I was so sick, but night before last we each poured a glass and I thought YES! 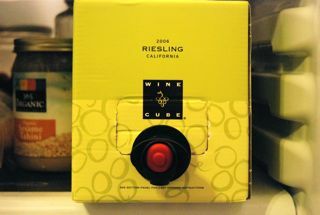 TARGET BRAND BOX RIESLING! DELICIOUSNESS ITSELF!! But then I drank it and thought NO! DEAR LORD, NO!!! You see, Target branding cannot make up for the fact that I hate the cloying sweetness of Riesling wine. HOWEVER, just because I hate the taste of this wine, DOES NOT MEAN I HATE TARGET BRAND BOX RIESLING> oh Contraire! SIMPLY BECAUSE I hate its taste, it means I will drink less of it. And that’s a good thing, right? After the first glass, the second goes down easy. And who can bear wasting wine, after all?